Have you ever thought about working in tourism? Published by the Irish Hotels Federation with support from Fáilte Ireland, Get a Life in Tourism aims to highlight what working in tourism is like, and what steps you need to take to get started in the industry. 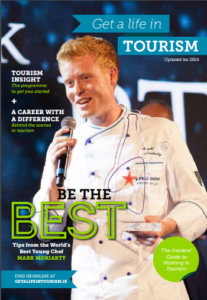 As well as the print edition, you can read the digital edition of the magazine online at getalifeintourism.ie, where you will also find a list of tourism and hospitality courses. If an exciting career, where each day is different, and where you get to meet and work with really great people sounds like the career for you, then come and join us. Irish tourism is ripe with opportunities and is ready to offer you an exciting career!